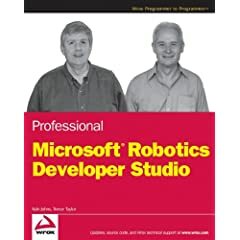 Go to Amazon.co.uk to pre-order Martin Calsyn's book on Robotics Studio. I'm guessing it will also be available in other coutries at Amazon and other retailers. A Robotics Studio CTP available for download here. It includes a development platform with visual programming tool for creating and debugging robot applications.